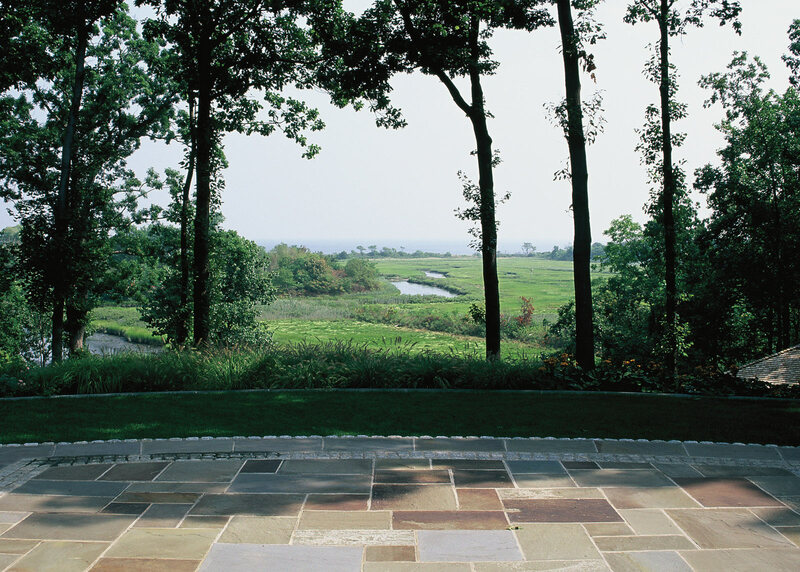 The design for a nine-acre estate overlooking Long Island Sound works within a topographically dynamic and ecologically sensitive site. An over 30-foot change in grade separates the house from the pool. 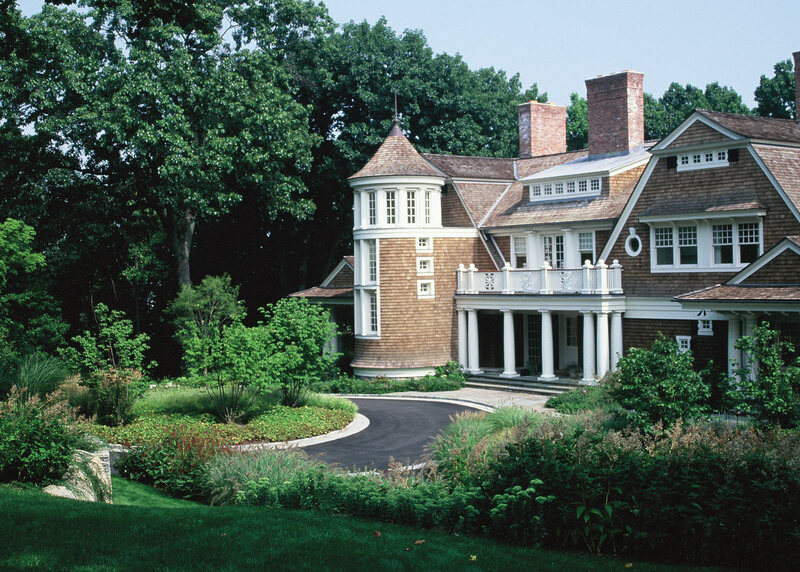 Though imposing, it was essential that the house, a 10,000-square-foot country mansion, not dominate the landscape, but become a part of it. To that end, the site-specific design focuses the views away from the house, towards the meadows, salt marshes, and sound. 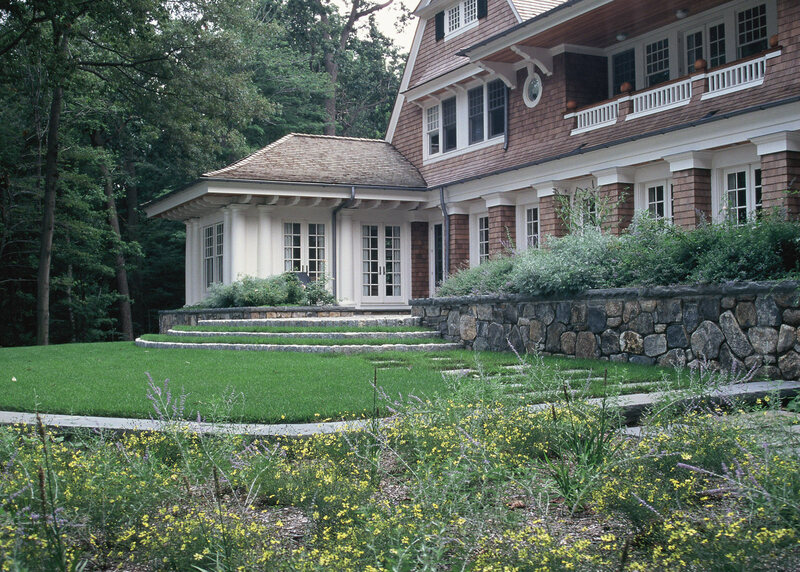 The house is tied to the land through a series of steps and terraces that capitalize on the natural changes in grade. The levels of the garden each serve as a succession of open-air rooms. The sequence begins with a porch terrace that extends the living room from the back of the house to the outdoors. 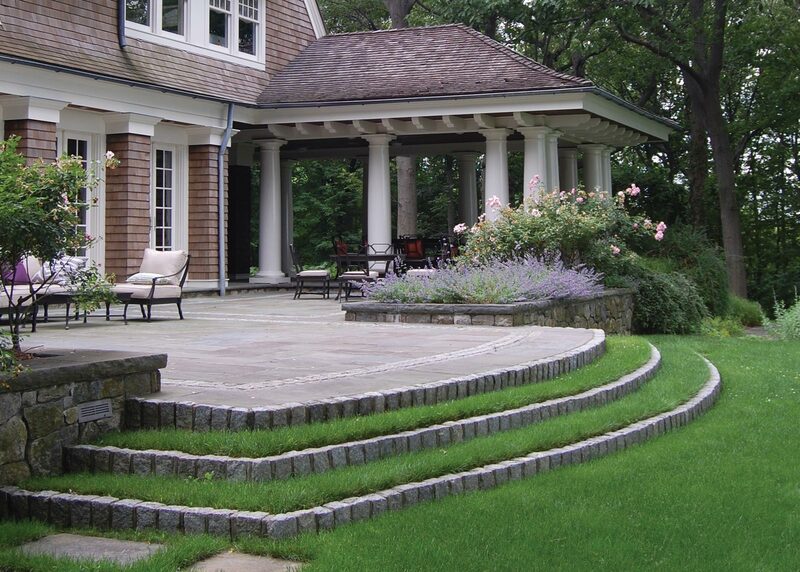 Three distinct paving patterns divide the terrace into different spaces. Stone planters, filled with communities of flowering perennials and cascading shrubs, embrace the terraces and provide a sense of intimacy within the grand view. 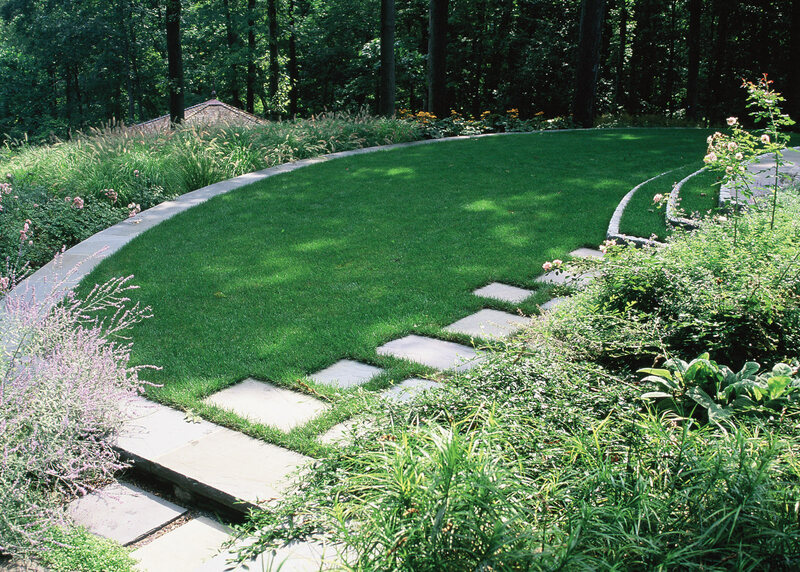 Turf steps bordered in granite cobbles descend from the porch terrace to a curvilinear lawn that overlooks the sound. 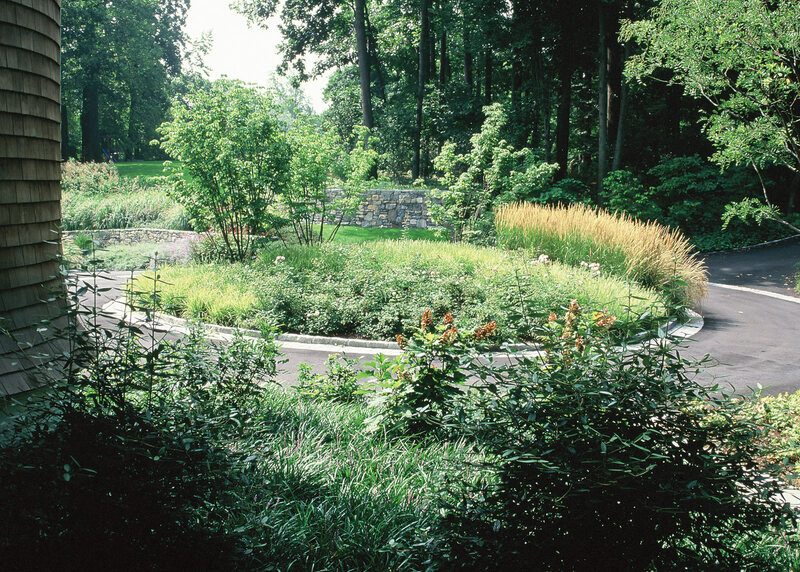 The space is framed with a stone border and masses of perennials and grasses. From the lawn, down an additional 20-feet, is the elliptical swimming pool. 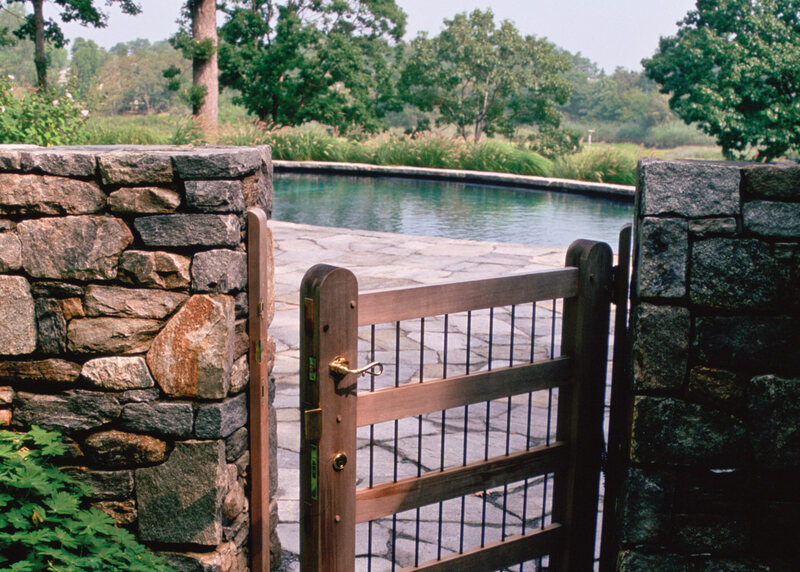 The pool’s wide steps are framed with planting and swaths of native grasses and wildflowers surround the pool terrace as an echo of the wetland below. Elsewhere on the property, planted forecourts, verandahs, and paths further balance the scale of the house with its context yet still provide appropriately proportioned entrances and boundaries.